Catering her childhood friend's beachfront wedding was a dream come true for Everly Swan — and, with hundreds of guests in attendance, great exposure for her new iced tea shop and cafe. But when the well-to-do groom is found floating facedown in the surf, the locals of Charm, North Carolina, turn their suspicions to his new bride. Could she have been so desperate to lay her hands on his fortune that she arranged for his murder before they even set off on their honeymoon? Everly knows her love-struck friend couldn't be behind the murder, but with clues pointing in several directions, she can't decide which wedding guest is the most likely culprit. Meanwhile, the frustratingly handsome Detective Hays has made it clear that Everly should stay out of the investigation altogether. But with a killer on the loose and a feeling that someone is watching her cafe very closely, Everly knows that if she can't solve this murder soon, her cake might be iced for good. 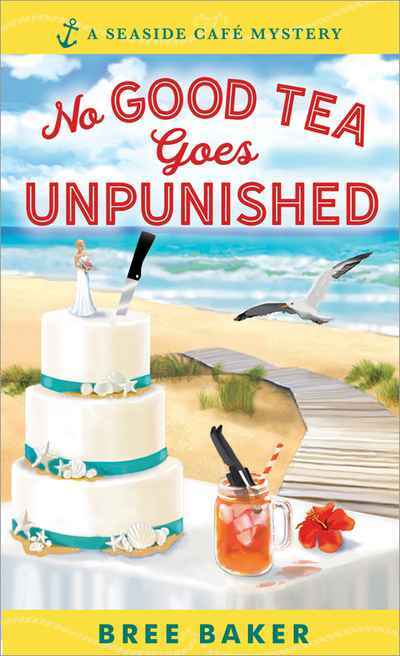 The second book in Bree Baker's popular Seaside Cafe Mystery series, No Good Tea Goes Unpunished is a delightfully deadly cozy mystery perfect for fans of Joanne Fluke and Kate Carlisle.